DeShayes Dream Courts specializes in consulting, designing, repairing, and constructing professional installed Tennis Courts in NJ, PA, and DE. Tennis courts are typically an amenity associated with estates and larger properties. Tennis is considered a lifetime sport that is enjoyed by children and adults of all ages. Having your own tennis court eliminates the drive time and wait or schedule time of playing on both club & public courts. In addition to standard asphalt tennis courts, there are several choices for more forgiving surfaces. A Cushioned surface where rubber is added to the court coasting like at the U.S. Open helps reduce the strain on joint, tendons, and bones. Clay, turf, and sport tile tennis courts all have the same benefits. 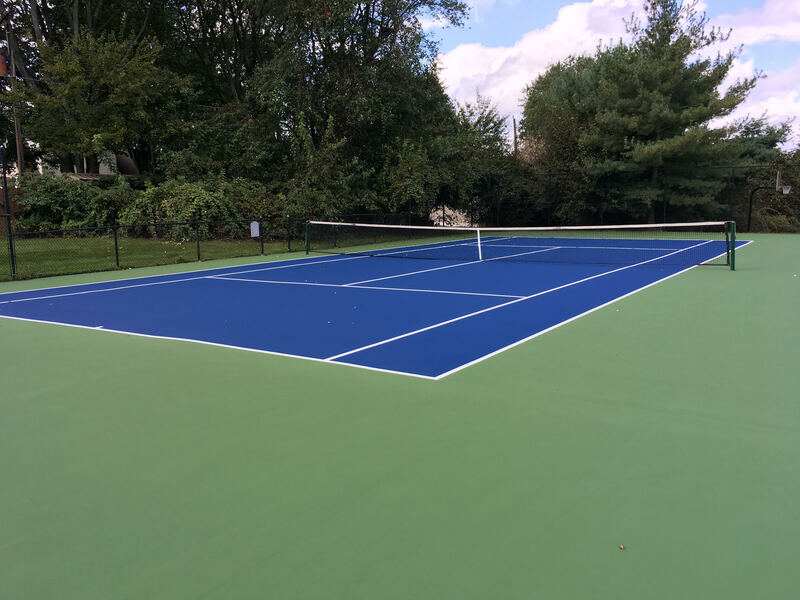 It is best to use a contractor that is familiar with & consults on all types of tennis courts so you can choose the surface you are most comfortable with and enjoy playing on the most. 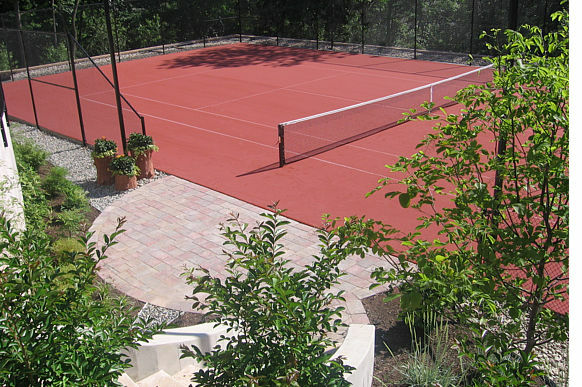 Call DeShayes Dream Courts today to learn more about a tennis court for your home! Do you know how large tennis courts actually are? Tournament tennis courts are 60x120ft which is equal to the footprint of a 14,400 sq ft home. This is a huge area, and most people think the area needed is significantly smaller. The reason being: size is relative. Most times you see tennis courts, they are either at a country club, tennis facility, or open space parks. Of the total court area, more than half encompasses the out of bounds. The play area is 78x27ft with doubles tennis being 78x36ft. Residential tennis courts are a minimum size of 50x115ft which is equal to the footprint of a 11,500 sq ft home. There is a difference of 1,450 sq ft between a tournament sized court and the minimum size for a residential tennis court that will still afford comfortable competitive play. This difference of 1,450 sq ft may come in handy when dealing with township restrictions on lot coverage, setbacks, and stormwater management. Please contact our office for more information on township restrictions and requirements. Most architects and engineers, when designing tennis courts where they are faced with restricted areas refer to architectural graphic standards for a minimum sized tennis court that is listed as 50×100. This is a big mistake. To illustrate the point, stand sideways, fully extend your racket as if you were chasing a shot that was over your head, the distance from the tip of your leading foot to the end of the racket is about 6 feet. If your court is only 100 ft long and baseline to baseline is 78ft, there would only be 6 feet at either end of the court between the baseline and the fence. This shorter distance would eliminate 30-40% of play and significantly affect your enjoyment of the game. 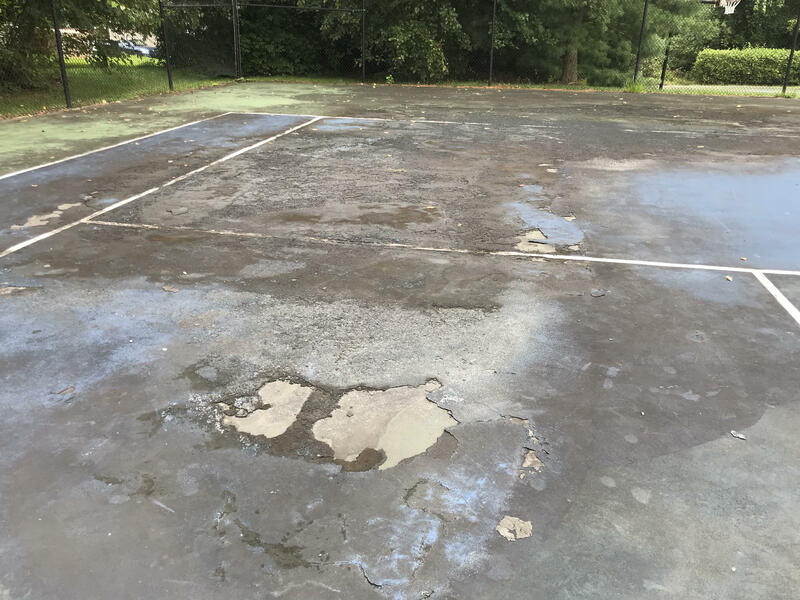 Most asphalt tennis courts have life expectancies of 10 to 15 years, although DeShayes has seen some that last up to 20 years and others that have only lasted a few years before cracking and other issues arise. The latter is typically due to poor base preparation, insufficient materials, and deficient installation practices. Above is a tennis court that was 20 years old and was poorly maintained. This tennis court required a complete makeover. Portions of the loose delaminating surface coating had to be scraped off and the cracks had to be cleaned, filled, and taped. The puddles and depressions had to be filled, the entire surface recoated with 4 new coatings, and lines had to be re-painted. 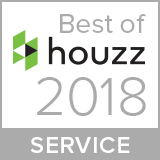 This is a meticulous process that takes about two weeks and when done properly yields spectacular results, while also saving you the over $100,000 it may cost to have your existing court removed and replaced. There are many different tennis court repair systems with different costs and lengths of guarantee, Please call DeShayes Dream Courts to evaluate your court’s existing conditions and discuss repair options.